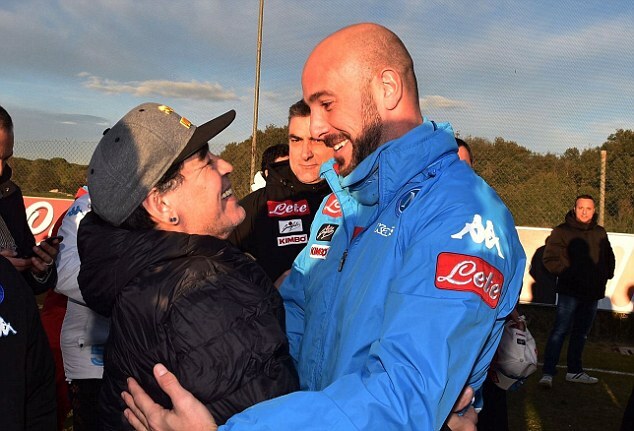 Diego Maradona appeared to be the life of the party as the Napoli legend returned to his former club and met the players. The diminutive Argentina great seemed to be in high spirits as he wore a broad grin and posed for a group photo with the squad. 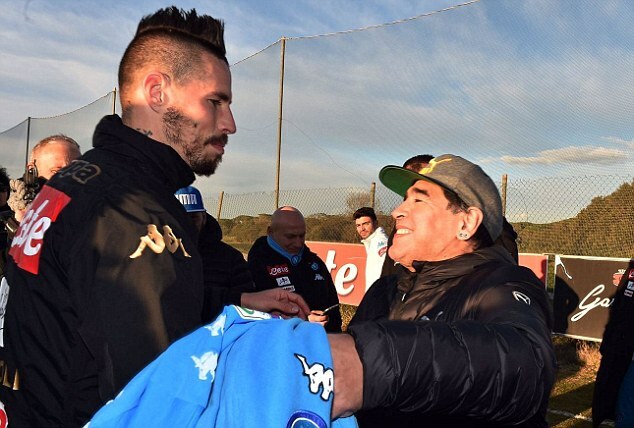 He also shared a warm embrace with Pepe Reina and Marek Hamsik, two of Napoli’s current crop. Maradona is adored in the city and still remembered as the club’s saviour after leading them to their first Scudetto in 1986-7, an anniversary celebrated this week. And it seems that club president Aurelio De Laurentiis wants Maradona back in Naples in a full time capacity. 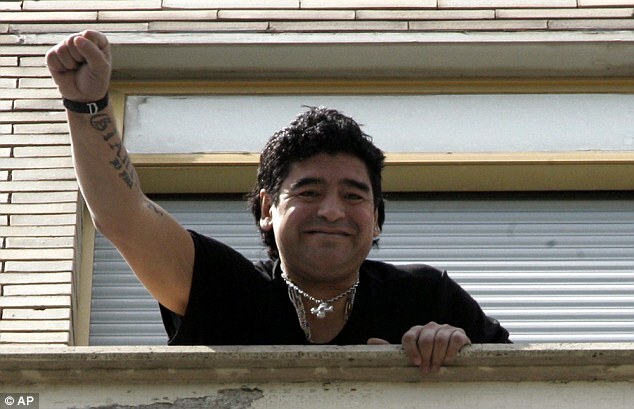 ‘It was the first step,’ Maradona said of talks with the Napoli president. ‘First of all I have to sort out the problems I have here in Italy, then I can work for Napoli in Italy and in the world. Support for De Laurentiis has been on the wane since the summer, when he was heavily criticised for allowing striker Gonzalo Higuain to leave for Juventus in the £75million deal. The film producer has faced calls to leave his position but Maradona, who still holds plenty of influence with the passionate fan base, says he was left impressed by his football knowledge. 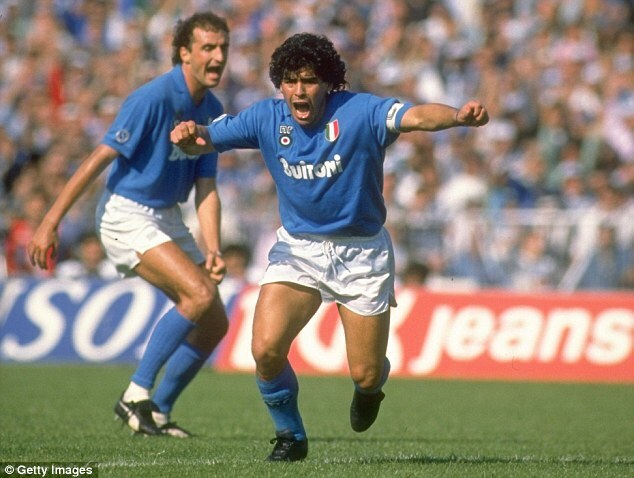 Maradona was the talismanic captain of the Napoli side that fended off Juventus to claim their first ever Scudetto in 1987. He would also inspire Napoli to another championship triumph three years later — their last Italian title win — before a 15-month ban for testing positive for cocaine brought an acrimonious end to his association with the club. Napoli honoured Maradona in 2000 by retiring his legendary No 10 shirt, the only retired jersey in the club’s history.